Although she has never seen one in real life, Olivia feels a deep connection to the Party Subs of Munchmore. She even refers to them as her “Spirit Snackimal”. 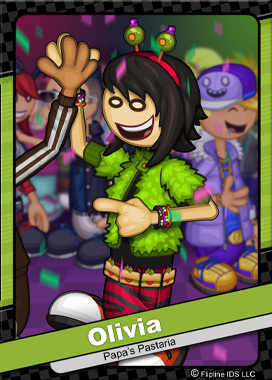 This is probably because Olivia loves to party, so much so that she host around six a year. Olivia spends months coordinating each party down to the finest detail. The music, food, decorations, and games of her parties are perfectly orchestrated. Olivia is currently pursuing her degree at Cavatelli Community College in hopes of one day becoming a professional party planner.